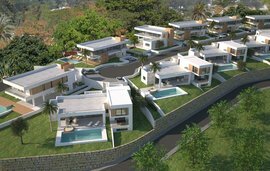 These beautiful contemporary off plan villas are located in Nueva Andalucia and have remarkable views stretching from east to west along the Mediterranean coastline. They are ideally situated in a golfers paradise right in the centre of the golf valley. As well as being close to all amenities and some of the best restaurants and private schools. Malaga airport is only 35 minutes away. 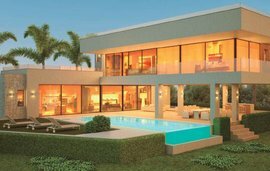 These architectural designer villas are stylish and modern making the most of the natural light, having open spaces, spacious rooms and large terraces . Every bedroom offers fantastic panoramic views and they of course have their own ensuite bathrooms. All the bathrooms feature lavish finish and high quality features, including underfloor heating, suspended toilets with soft close mechanisms and LED illuminated mirrors. The master bedroom has its own dressing room and the other bedrooms are fitted with built in wardrobes offering spacious storage space. The enormous basement space features many sources of natural light and could be turned into a home cinema, gym, sauna or anything that you could want. Other features of these quality villas are underfloor heating, designer kitchen, bioethanol fireplace, solar panels, quality marble flooring, eco design, south facing sea views and an infinity pool design. The building licence has now been issued and they will start work in November 2018. Property locations are not exact, please check with the Winkworth Spain office.